Audioquest DragonFly Red review | What Hi-Fi? When the original DragonFly flew into our testing rooms back in 2012, it was a breath of fresh air. A DAC and headphone amp disguised as a USB stick – and with great sound to boot? It was some serious innovation, and became the de facto quick and easy way to give a laptop a sonic upgrade, especially after the refinements and price drop of the v1.2 model. Here in 2016, however, the landscape is markedly different – and rising above the DACtastic tide is far harder. AudioQuest’s approach? A two-pronged assault. On the one side there’s the DragonFly Black, an upgrade on the outgoing v1.2 that costs just £90. On the other side is our test subject today, the DragonFly Red. AudioQuest has set itself quite a challenge by giving the Red a £170 price tag to justify, and on paper the case doesn’t look particularly strong. One criticism that can be levelled at the DragonFly range is that its support for high-resolution music tops out at 24-bit/96kHz. The Black retains that limitation – but then it is exceptionally affordable. The problem is that the twice-as-pricey Red is similarly restricted. AudioQuest points to a number of upgrades for the Red over the Black, though: a more advanced DAC and headphone amp for starters, plus a “bit-perfect digital volume control contained on the DAC chip itself” that’s apparently a big improvement on the analogue volume control in the Black. None of that sounds particularly Earth-shattering, but it does bring with it some rather good news: the DragonFly Red sounds better than the Black. At the very least £80 better. The Black is already a big improvement on simply plugging your headphones into your laptop’s headphone socket, with timing, attack and detail getting a really huge boost. But the Red is a far more sophisticated listen. The first thing you notice when going from one to the other is the Red’s extra sonic weight. This is partly in the form of overall bass extension, but what’s more impressive is the extra body given to each and every note. There’s a three-dimensionality, solidity and texture to every sound that makes the Black sound a little two-dimensional by comparison (even though it’s undeniably accomplished in its own right and price-point). As well as being fuller-bodied, each of these notes also contains a good deal more detail, and that, combined with excellent low-level dynamics, means everything has a more natural, subtle and expressive sound. Then there’s the way the Red organises the presentation. Feed both DACs the 24-bit version of Radiohead’s Burn The Witch, and while the Black allows the fabulous organised chaos to become a bit of a muddle as the track reaches its crescendo, the Red maintains full control, allowing you to pick out and admire every thread of the gloriously complicated arrangement. The whole track builds and builds, becoming ever more frantic and layered – and, when it suddenly ends, you feel exhausted the way you do when you’ve just experienced something genuinely dramatic. Listening to the same track through the Black doesn’t leave you with the same feeling. If you want to take things back to basics and are wondering whether a DAC such as this will make a difference to your daily dose of Spotify, allow us to confirm that it will. Even these comparatively low-res streams get a hefty improvement in the detail, definition and dynamic departments, and they’re as strong a case for the Red over the Black as 24-bit stuff is. With that in mind, the fact that both the Black and Red can also work with Android (check your handset can output audio over USB) and Apple smartphones (using Apple's camera adapter) could prove a big selling point for a good number of potential buyers. The one tiny blot on the DragonFly Red’s otherwise immaculate test report is that we’ve found the glossy red finish (which we’re rather partial to) seems rather easy to chip. There’s a pouch provided for safer transportation, but one suspects a Red that finds itself roughed up by life on the road will become blemished in no time at all. The qualities that made the previous version of the DragonFly so great remain just as compelling now. It’s a supremely compact and convenient device that can be taken anywhere for an immediate musical boost, and having the logo light up in different colours to tell you the file format running through it, still seems an elegant and instant method of delivering mind-easing information. If you’re unconcerned by that slightly flaky finish (and who buys a USB stick-styled DAC for its aesthetic properties? 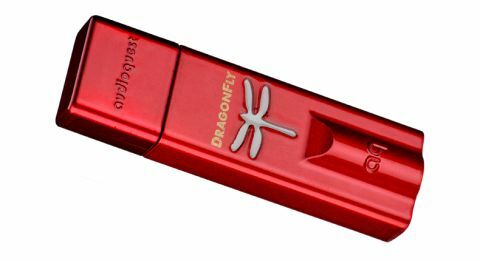 ), you can consider the DragonFly Red a pretty perfect computer music upgrade.